Former Red Sox All-Star catcher Rich Gedman grew up a die-hard Red Sox fan just like so many of us. Gedman, who was born and raised in Worcester, MA, was only eight years-old when the Red Sox played the St. Louis Cardinals in the 1967 World Series but he still remembers his favorite team’s seven-game loss. “I remember that I hated Bob Gibson [St. Louis Cardinals’ ace pitcher] because he won three games and cost us the World Championship,” Rich chuckles during an interview at spring training this year. It was eleven more years before the Red Sox made it back to the World Series. And when they did Rich Gedman was the starting catcher and an important cog in Boston’s lineup. Gedman is quick to acknowledge that playing for the Red Sox, and making it to the World Series was a dream come true. “Like so many New England kids, playing for the Red Sox was my boyhood dream. I’m grateful that I had that opportunity. I was very fortunate,” he acknowledges. Rich Gedman was born in Worcester, MA, on September 26, 1959. He haunted the Worcester sandlots and he has a clear memory of his first trip to Fenway Park. “It was the Red Sox against the Orioles and we sat in the right-field bleachers. My fifth grade teacher, Mr. Monfredo, took me and it was Lonborg pitching for us and Jim Palmer for Baltimore,” Rich remembers. Gedman went to St. Peter’s Marian High School in Worcester, MA, where he played in a very good baseball program. He pitched and played first while helping St Peter’s Marian to a state championship as a senior in 1977. When MLB’s free agent draft was held that June, more than 700 amateurs were drafted but Rich Gedman was not among them. Fortunately, long-time Red Sox scout Bill Enos had spotted Gedman’s potential and he convinced the club to sign Rich as an undrafted free agent and convert him to catcher. 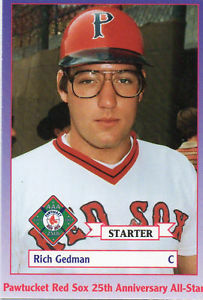 The 17-year-old Gedman was signed by the Red Sox in August of 1977, and he made his major league debut in September 1980. That was rapid by any standard but it took a lot of hard work to make it happen. “I was a grinder my whole career,” Rich emphasizes. “Fortunately, I had learned a strong work ethic from my parents and it helped me to advance through the Red Sox system,” he says reflecting on his journey from the Instructional League to Fenway Park, by way of Winter Haven, FL; Bristol, CT; and Pawtucket RI. After a brief return to Pawtucket, Rich’s wish to return to the big leagues came true in mid-May 1981. He remained in the majors for the next twelve seasons. 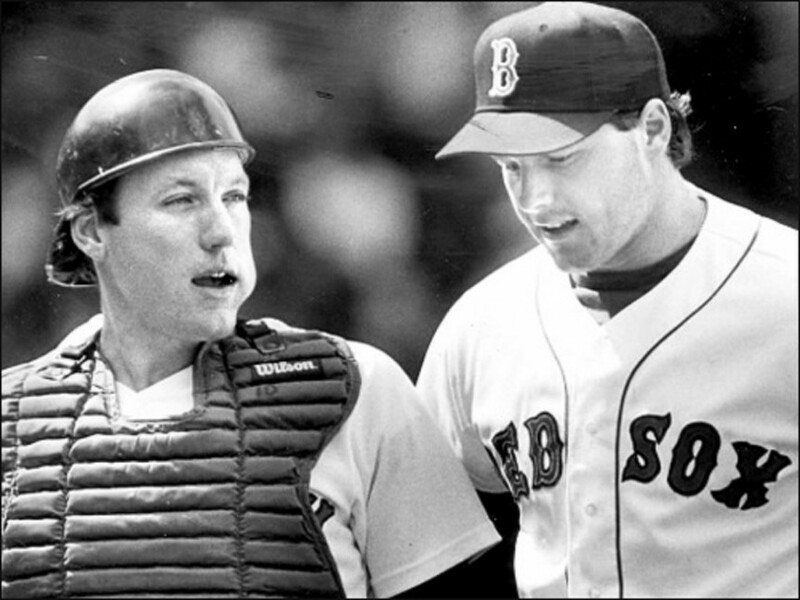 He caught 133 games as Boston’s regular catcher in 1984, and in 1985, he was named to his first All-Star team. When he reported to the Red Sox 1986 spring training camp in Winter Haven, FL, Gedman felt good about the upcoming season. When the Red Sox played the Seattle Mariners on April 29, a cool spring night at Fenway Park, the club was in second place in the AL East, three games back. 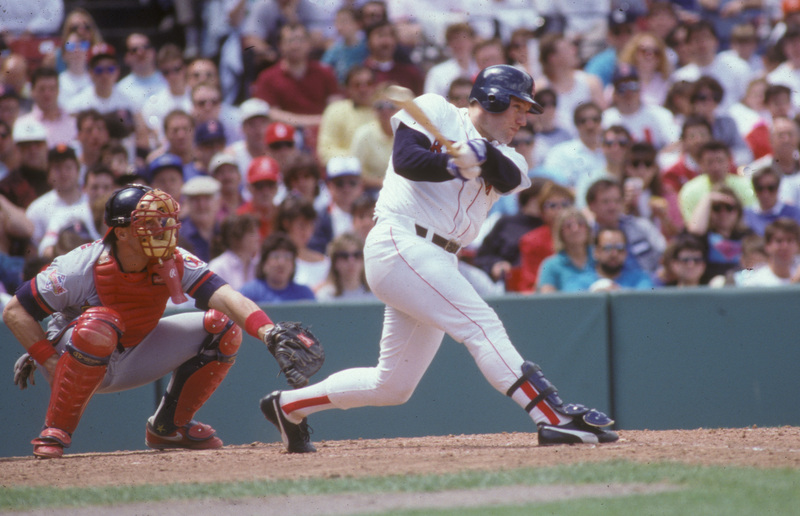 When the night was over starter Roger Clemens had set a new major league record for strikeouts (20), Rich Gedman had set a new American League record for putouts by a catcher (20), and the Red Sox were on their way to first place in the American League East. The Red Sox went on a 12-4 spurt after the 20-strikeout game and they moved into first place to stay in mid-May. But they suffered their first setback when starter Bruce Hurst strained his groin late that month. The Red Sox hit a bit of a speed-bump after the All-Star break, going 14-19 through August 18, but then general manager Gorman engineered a trade with the Seattle Mariners bringing shortstop Spike Owens and outfielder Dave Henderson to Boston. Owens helped to settle down the infield and Henderson’s postseason feats are the stuff of legends. The Red Sox clinched the East Division championship on September 28, with a win over Toronto. Boston was matched with the California Angels in the American League Championship Series beginning on October 7 at Fenway Park. The Red Sox-Angels series was expected to be close. So it was a surprise to find the Angels one out from the ALCS Championship with Rich Gedman at bat in the ninth inning of Game Five in Anaheim. 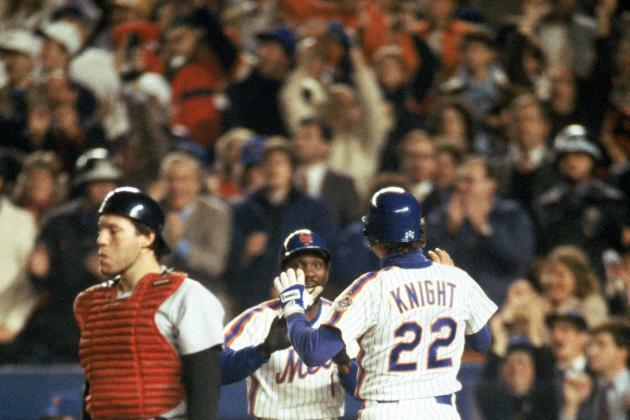 “I only had one thought in mind,” Rich recalls, “And that was not to make the last out—to keep the inning going. “They brought in left-hander Gary Lucas and he started me off with a curve that never broke. I put up my hand for protection and the ball hit it. I wasn’t pleased but then my reaction was, ‘I’m on first. I kept the inning alive.’” The next batter, Dave Henderson, homered to give Boston the lead in a game they ultimately won 7-6. The Red Sox faced a heavily-favored New York Mets team that had won 108 games, but Boston surprised the baseball world, winning two in a row at Shea Stadium. 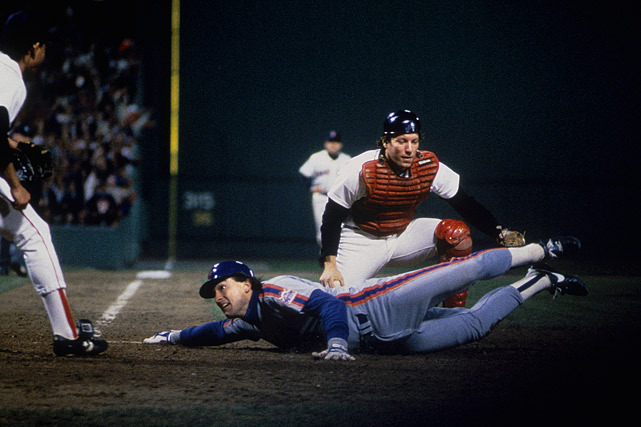 The Mets reversed the outcome, winning two straight at Fenway, but a 4-2 Red Sox win in Game Five sent the series back to New York with Boston one game from a World Championship. In the ninth inning of Game Six the Red Sox found themselves in the same position as the Angels two weeks before: one out from winning the Series. But three singles, a wild pitch, and an error gave the Mets a 6-5 win. The Red Sox had an early lead in the deciding Game Seven but they faded and the Mets won 8-5 giving them the World Championship. 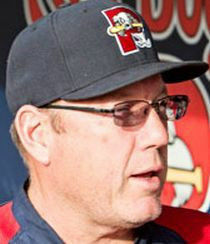 Rich Gedman is in his sixth season with the Red Sox as a hitting instructor in their minor league system. The 2016 season will be his second year as the hitting coach for the AAA Pawtucket Red Sox. There is no question that Gedman is ideally suited for his instructional role. And how much has Rich Gedman enjoyed the three Red Sox World Championships? “I have been a Red Sox fan all my life. You don’t stop being a fan just because you have worn the uniform,” he points out. “The 2004 Championship was like a reward for living and dying with the team through all the years. “On a personal level, the Red Sox organization asked a lot of the former players to ride along in the duck boat parade in 2004. That was very classy of them,” he remembers. “And the club went out of their way to emphasize that the 2004 Championship belonged to the 1946, 1967, 1975 and 1986 teams as well. That was very, very thoughtful. Portions of this article originally appeared in Red Sox Magazine. To subscribe to Red Sox Magazine click here. Discover the dramatic true story of the historical 1967 Red Sox Impossible Dream season through an insider’s look at the lives of these gritty players who overcame 100-1 odds to win the AL pennant.